Wherever energy-efficient light engineering is required, light diodes made of organic material, so-called OLEDs, are often used. Light diodes emitting white luminescence are in particularly high demand. In addition, lasers either emitting white luminescence or whose colour can be set offer interesting options for application in science and technology. One way to create white luminescence is to use several lasers emitting red, green and blue light of the same intensity or conducting through very thin glass fibers. The disadvantages of this technology are the high costs due to the use of several single-color lasers and the difficult handling of the glass fibres. Alternatively, lasers are used whose light-emitting medium consists of a mixture of gases or colouring agents, with each gas or colouring agent creating laser light of a different colour. At a certain mixing ratio, the laser emits white light. However, the disadvantage here is that the various substances absorb part of the radiation, which reduces the efficiency and the luminous intensity of the laser. KIT scientists have developed a colouring agent that can be excited to luminescence by irradiation with light. 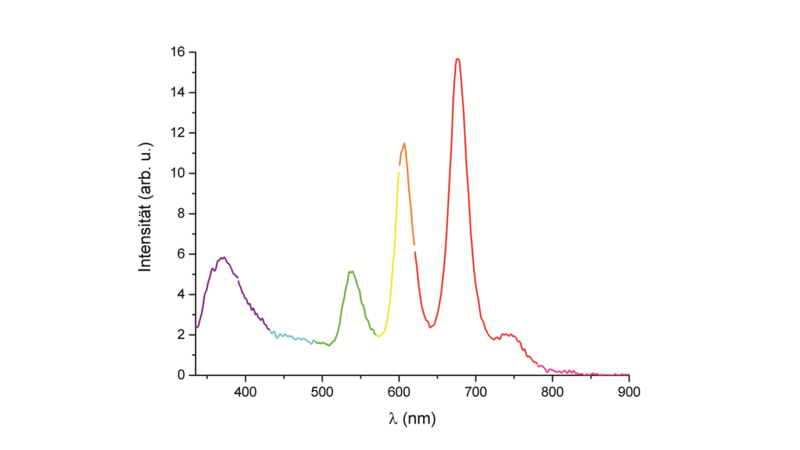 The emission spectrum shows at least three narrow maxima of luminescent intensity that are clearly separated from one another. These maxima, also called emission bands, are in the range of visible light, each with different colour. Used in a laser, the compound creates several colours simultaneously or white light by mixing the coloured emissions. Since the light-emitting laser medium consists of only one single substance, losses due to absorption can be reduced and a laser with high light output can be produced.